The Detroit River is 44km (28 mi) long and flows between Lake St. Clair and Lake Erie. It borders Canada and USA and divides the cities of Detroit, Michigan and Windsor, Ontario. The most common bridges and crossing points, include the Ambassador Bridge, the Detroit-Windsor Tunnel and the Michigan Central Railway Tunnel. The river's name comes from the French Rivière du Détroit, meaning River of the Strait. The main fish species that inhabit the Detroit River include lake whitefish, sturgeon, silver bass, largemouth bass, smallmouth bass, steelhead, perch, bluegill, crappie, northern pike, muskie and walleye. Fishing is very popular in the Detroit River and anglers from all over the USA and Canada, flock to the river for the excellent walleye, bass and muskie fishing. The most sought after and heavily targeted fish in the Detroit River is the walleye. It is estimated that walleye fishing alone brings in $1 million in revenue to the communities along the Detroit River. In the spring the river is full of walleye as they enter the system from Lake Erie to spawn. Anglers line the banks and large boat flotillas dot the river as fishermen catch their limits of these tasty fish. Vertical jigging is the technique of choice, generally using a large jig head 3/4 to 1 oz tipped with a large plastic worm or swimbait. The walleye travel in schools and once you find a few, there are usually others around. 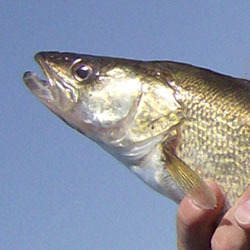 Average fish are 1-3 lbs, although trophy walleye in excess of 10 lbs are caught annually. Another highly prized fish in the Detroit River, is the white bass. In spring, generally mid May until early June, millions of White Bass enter the river to spawn. The fishing for these feisty aggressive fish, can be fantastic. With 100 fish days not uncommon. The popular shore spots become lined with anglers filling coolers of white bass. Almost any shiny lure that is jigged or casted into the strike zone can catch white bass. Although many anglers will use worms or minnows on perch rigs with large weights and just gently bottom bounce until they feel a strike. Muskies fishing in the Detroit River is also very popular, with anglers targeting them mostly late in the fall, October and November, when muskie are aggressively feeding in preparation for winter. Large crankbaits, spinners and shadzillas are usually the lures of choice. 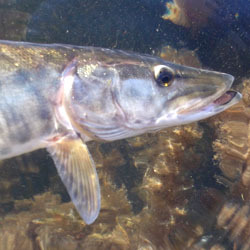 Muskie in excessive of 20 lbs are caught regularly, even by shore anglers. Other species that can be caught sporadically, include smallmouth bass, largemouth bass, pike, steelhead and freshwater drum. You never know what you will catch in the Detroit River, give it a try and happy fishing. 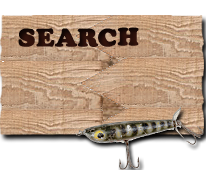 For more information visit the Lake St. Clair Fishing Forum. Each detailed map provides depth, contours, structure, boat ramps, and updated fishing information. Detroit River fishing maps also include lake info such as gamefish abundance, forage base, water clarity, weedline depth, bottom composition, complete latitude/longitude grid lines and dozens of GPS waypoints & coordinates.